We spent a fair amount of time scouting wheat fields for cereal leaf beetles earlier in the season. Now it is time to focus attention on adjacent corn fields. 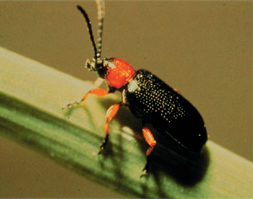 The adult cereal leaf beetles can now be found in adjacent corn fields. They are primarily found on the perimeter of the corn fields. Though I have encountered them throughout some corn fields. Adult cereal leaf beetle damage appears as longitudinal slits between the leaf veins. Corn plants usually outgrow the injury. Unlike larval damage in wheat, there are no firm thresholds for adult damage in corn. One threshold suggests treatment when 10 or more adults are found per plant and 50% of plants show feeding damage.